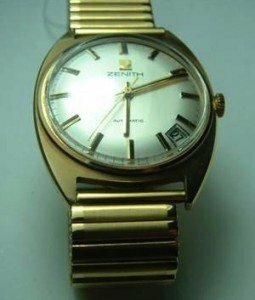 An automatic Gentleman’s Zenith bracelet wristwatch. A silvered dial with gilt hour markers and black inserts. Bordered by a minute track. Date aperture between four and five o’clock. Gilt hour and minute hands with black inserts plus gilt second hand. 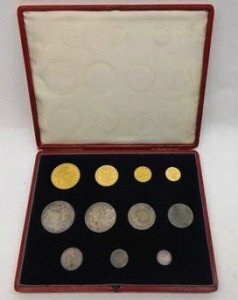 A Victorian Jubilee Coin Set in Gold and Silver – 9 coins including: Gold £5 piece, Gold £2 piece Sovereign, Half Sovereign, Crown, Four-Shilling Piece, Half Crown, Florin, Shilling, Sixpence, Three-penny piece in red leather presentation fitted case. 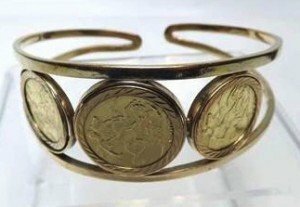 A late 20th Century hallmarked 9 carat Gold Openwork Torc design Bangle, featuring a Victorian Gold Sovereign dated 1890 and two George V Gold Half-Sovereigns dated 1912. 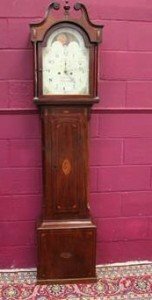 A regency period long case clock with eight day moon roller movement, white enamel break arch dial with painted floral spandrels, Arabic numerals, ringed winding holes and subsidiary seconds dial and gold painted hands. 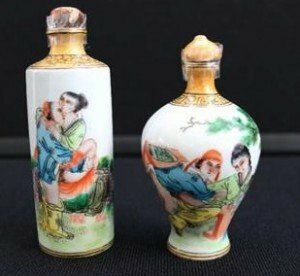 Two oriental snuff bottles with stoppers, each hand painted with scenes of a couple in the act of ‘coitus interrupts’. 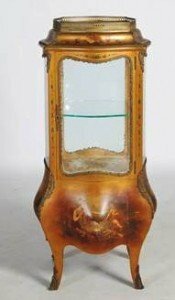 A Victorian 1890 cranberry milx glass reservoir, a brass Corinthian column table lamp, with an acid etched cranberry glass bowl shade and glass funnel. The reservoir is pressed glass and has flowers which is overpainted on the outside. 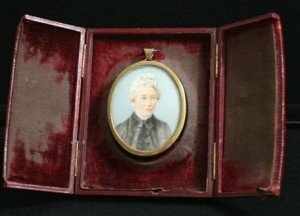 A Victorian miniature on ivory mounted in a burgundy leather frame stamped by Weson Sloane Sq London. The ivory portrait is mounted in an oval brass frame. 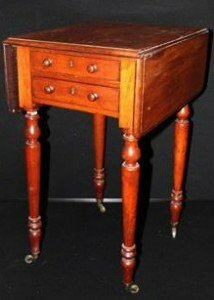 A Victorian side table, Sutherland table leaf joints, twin draws and dummy fronts on opposite side, brass casters. 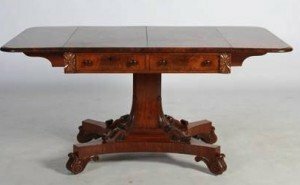 A 19th century mahogany drop leaf pedestal table, the rounded rectangular top with a moulded edge, above two cockbeaded frieze drawers, raised on a tapered rectangular column and concave platform base with scroll carved feet and recessed brass casters. 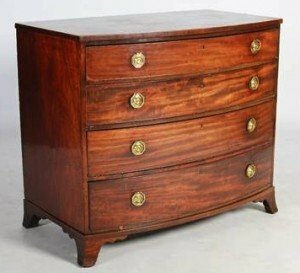 A 19th century mahogany bow front chest, the shaped rectangular top with a boxwood lined edge, above four long graduated cockbeaded drawers with octagonal brass drop handles, raised on splayed bracket feet. 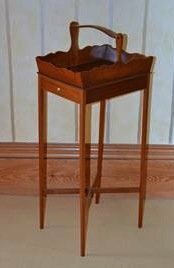 An early 20th century mahogany basket on stand, the rectangular top with gallery edge and upright handle, above a shallow frieze drawer, raised on tapered square supports united by an X-shaped stretcher. 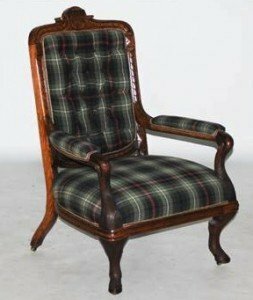 A Victorian carved oak Stags leg armchair, the top rail carved with Crested shield surmount above a Tartan upholstered button down back, arms and seat raised on front legs carved to simulate those of a Stag, resting on brass casters. 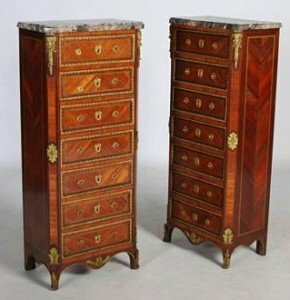 A pair of late 19th century tulipwood, parquetry and gilt metal mounted marble top chests, each fitted with seven drawers, one with three faux drawers opening to a fitted interior with two small drawers and writing slope, raised on short cabriole supports with gilt metal sabots. 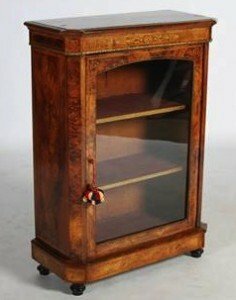 A Victorian walnut, marquetry and gilt metal mounted pier cabinet, the rectangular top above a glazed cupboard door, opening to a fitted interior of two shelves, raised on bun feet. 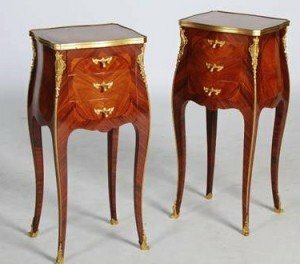 A pair of French Louis XVI style kingwood and gilt metal mounted bedside tables, the shaped rectangular tops above three small drawers, raised on four cabriole supports with gilt metal mounts trailing to foliate cast sabots. 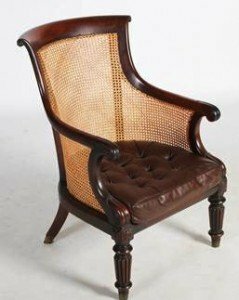 A William IV mahogany Bergere library chair, with scroll carved top rail and foliate carved arms, the later cane work back and seat with brown leatherette cushion, raised on reeded tapered cylindrical supports with brass cups. 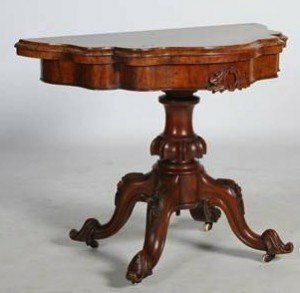 A Victorian walnut demi-lune card table, the shaped hinged top above a plain frieze centred with scroll and foliate carved detail, raised on a tapered cylindrical column and four foliate carved downswept supports, resting on white ceramic casters. An early 20th century free standing Vernis Martin type vitrine, with a glazed cupboard door opening to a glass shelf interior, with three glass panel sides above a bombe lower section decorated with figures and landscape views, on short cabriole supports with scroll cast sabots. 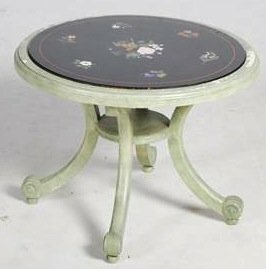 An Italian pietra dura occasional table, the circular marble insert decorated with scattered foliate sprays within a green painted frame, with four concave supports resting on ball feet united by a small under tier. 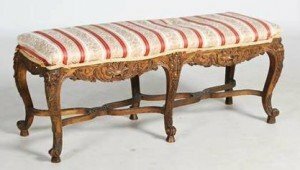 A Rococo style gilt wood duet stool, the striped upholstered seat raised on six foliate carved cabriole supports with scroll toes, united by concave stretchers.